Dusseldorf, Germany - Vladimir Klitschko knocked out Jean-Marc Mormeck of France with a stinging left-right combination in the fourth round to retain his world heavyweight titles at the Esprit Arena on Saturday. The Ukrainian, who holds the IBF, IBO, WBO and WBA versions of the championship while his older brother Vitali has the WBC crown, took his career tally to 50 knockouts from 60 fights with just three losses. Klitschko, 35, had knocked down former cruiserweight world champion Mormeck, who at 1.81 metres is 17 centimetres shorter than the Ukrainian, in the second round with a huge right that sent the Frenchman sprawling. 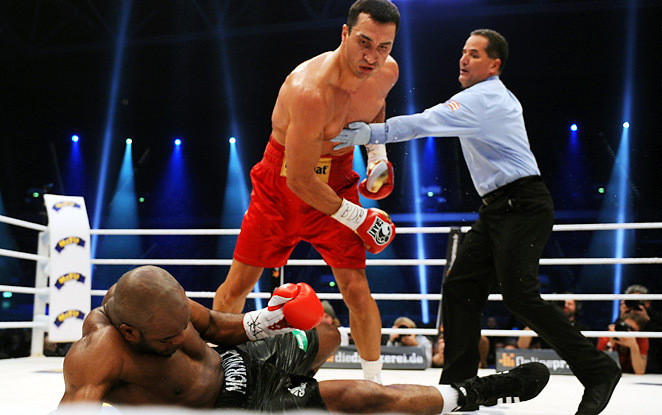 Klitschko, whose last defeat stretches back to 2004, inflicted more punishment in the next two rounds, his left working to open his opponent up as Mormeck ducked low to avoid his wider reach, before finishing him off in the fourth. “I have been doing this for 15 years and now I have my 50th knockout,” Klitschko said in a ringside interview. “The road was long but I am here. “He tried everything in the second and third rounds. I got a job in the face that is still stinging but I dominated,” he added as some of the 50,000 fans whistled and jeered after the short fight. Mormeck, looking to become the first heavyweight world champion from France, hardly landed a punch and was left wondering how it ended so quickly.